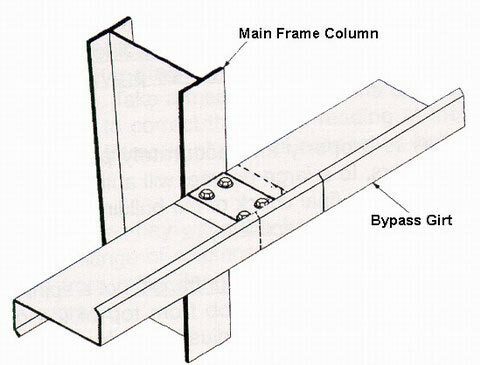 A horizontal structural member that supports vertical loads. It may consist of several pieces. Usages: “C” Girts are used for headers, “Z” Girts elsewhere secondary framing system to attach and support wall covering. Gauge, depth, spacing & wind load combinations limit girts to a maximum of 40′ bays or shorter. 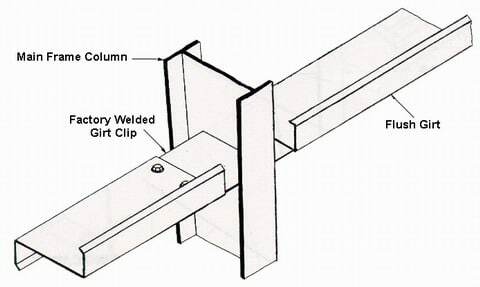 Flush girts with girt face in the same plane as column face. Greater interior clearance, easier interior finish. Combinations of size, gauge & spacing. Optimum design and economical pricing. Standard girt spacing, first girt at 7′ 3 3/4″ and maximum of 6′ there after. Other spacing available for design. Fits doors, etc., optimal design. Pre-painted, factory baked red oxide finish. Smooth, attractive appearance, improved adherence & durability. Low girt option available on request at 3′ 6″ Stiffening of the wall section, and satisfying high wind conditions.